We are the only human species on earth, but it wasn’t always this way. Just 50,000 years ago 3 other human species lived alongside us. Which might sound like a lot, but it turns out we still haven’t found them all, as researchers have identified a previously unknown human species 1. And to make it cooler, this discovery came not from examining fossils, but our own DNA. See, humans evolved in Africa. Some people left, carrying their African genomes with them. However, they somehow wound up gaining genes not found in Africa. It turns out we have the Neanderthals to blame, as interbreeding introduced some of their DNA into the mix. However, not all of those non-African genes came from Neanderthals. Enter the Denisovans, another branch of humanity we also interbred with, nabbing some of their genes in the process. But that still wasn’t enough to explain all the non-African DNA in our genome. This led some researchers to speculate that there was another, unknown human species that interbred with our ancestors at some point. However, unlike the Neanderthals and Denisovans, we didn’t have any fossils of this unknown human species; making this premise very hard to prove2. Enter AI. Or deep learning. I can never decide which term sounds cooler. “Neural networks” is pretty snazzy too. Regardless of what you want to call it, the method is the same. Mondal et al.1 trained a computer on thousands of simulated genomes so that it learnt how to figure out accurate family trees. When it was unleashed on our genomes, it found evidence for this hypothetical human species. Except now, with the support of deep learning, it seems much less hypothetical1. Ultimately, deep learning identified a few plausible family trees for humans. They all included this hypothetical species though, labelled Xe. They all also indicated that it interbred with humans as we left Africa, introducing their genes into Asian populations1. However, its exact place in our family tree is still a bit mysterious, much like the species itself. The most likely family tree produced by deep learning, although it is only marginally more plausible than other scenarios1. Now, eagle eyed readers might also have noticed another enigmatic human species on that tree. It’s on the far right, labelled Xd. This is an old species, as indicated by its early split from the other humans. Mondal et al. speculate it might be Homo erectus or some other ancient human1. Of course, since we know about Homo erectus this discovery doesn’t make for as good headlines as human Xe. It’s still a fascinating discovery, and really highlights just how little we know about our family. After all, we’re approaching this from our point of view; wondering who interbred with Homo sapiens. We’re interested in human Xe as it pertains to us. But there are other species out there, with their own family histories and weird inbreeding events; and we might never spot them if we only study ourselves. Mondal, M., Bertranpetit, J. and Lao, O., 2019. Approximate Bayesian computation with deep learning supports a third archaic introgression in Asia and Oceania. Nature communications, 10(1), p.246. Mondal, M., Casals, F., Xu, T., Dall’Olio, G.M., Pybus, M., Netea, M.G., Comas, D., Laayouni, H., Li, Q., Majumder, P.P. and Bertranpetit, J., 2016. 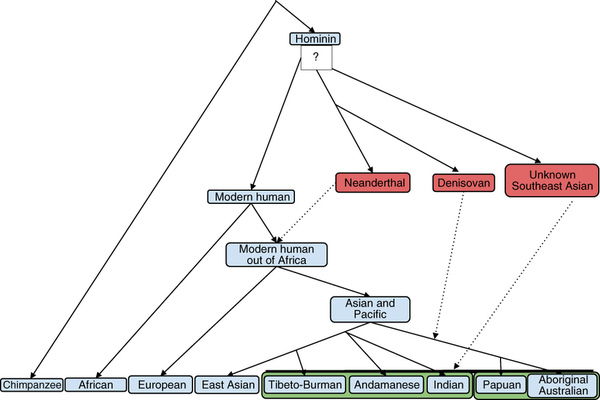 Genomic analysis of Andamanese provides insights into ancient human migration into Asia and adaptation. Nature Genetics. This is nothing new. Prominent Anthropologists like David Reich and Svante Paabo have been saying this for years. But it’s more specific. It’s specifically Africans, save the Khoi-San, who interbred with primitive, little brained X species. Most likely that X is Homo Naledi or Ergaster. 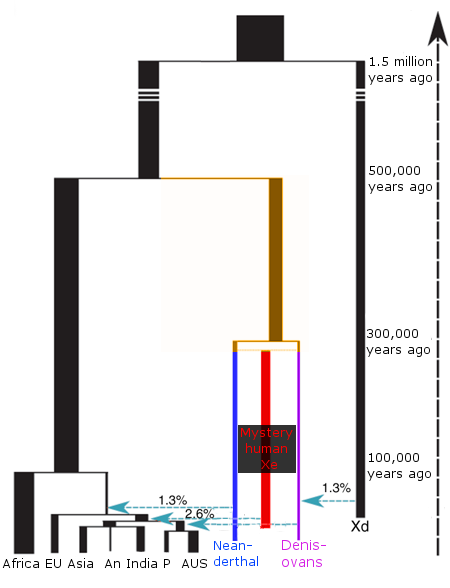 Except the chronology makes no sense for erectus, as the tree indicates Xe emerged ~300 kya whilst erectus is from ~1.9 mya. Naledi makes a bit more sense chronologically, but not physically, being very distinct to the Neanderthals and Denisovans Xe is most closely related to on this demographic tree.